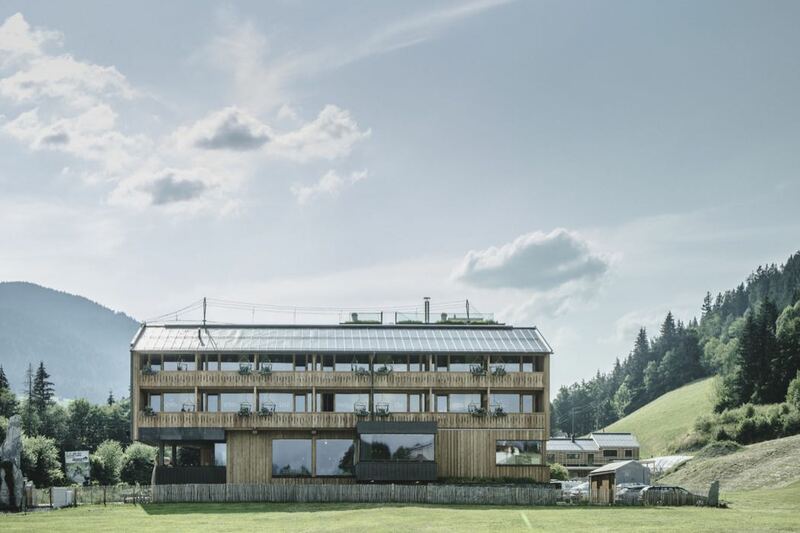 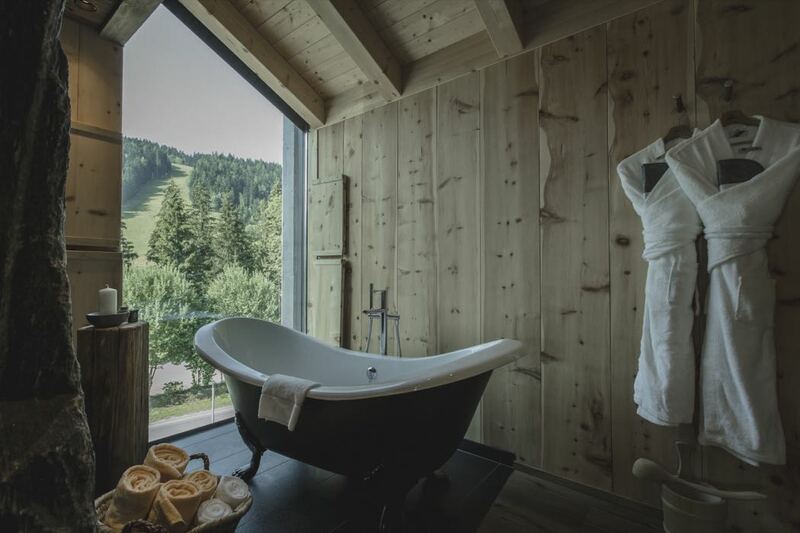 Mama Thresl is the brainchild of Renate and Huwi Oberlader, who are well known by luxury travel experts for their lovely Chaletdorf Priesteregg hotel. 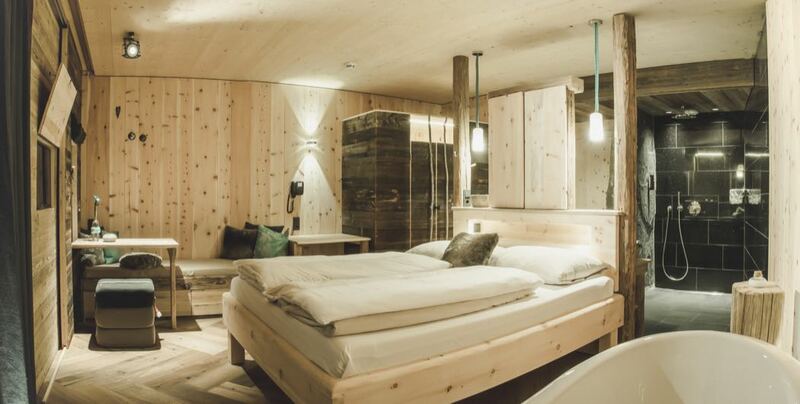 Their new hotel is uber chic, contemporary and modern, and recently opened in Leogang, Salzburg. 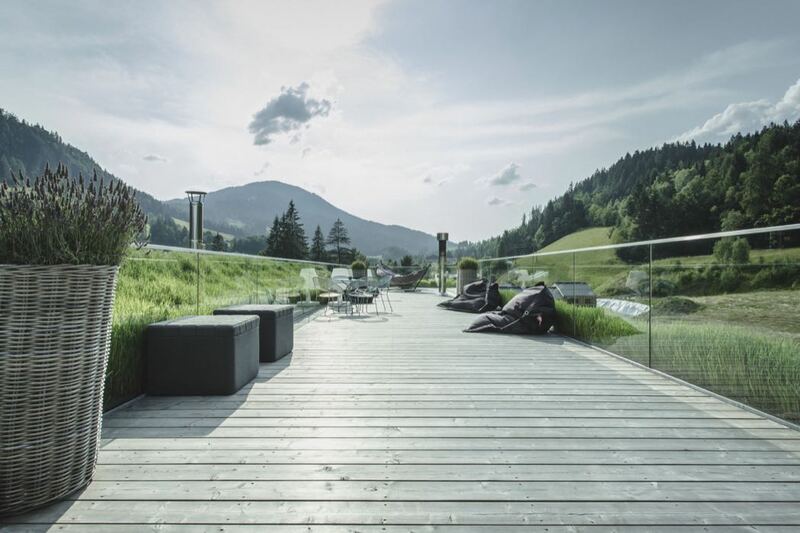 You will want to choose this hotel for the gorgeous decor, but also for the beautiful “Leoganger Steinberge” for the skiing, and in the summer for mountain biking, paragliding, mountain climbing, walking and any other outdoor pursuit you can think of. 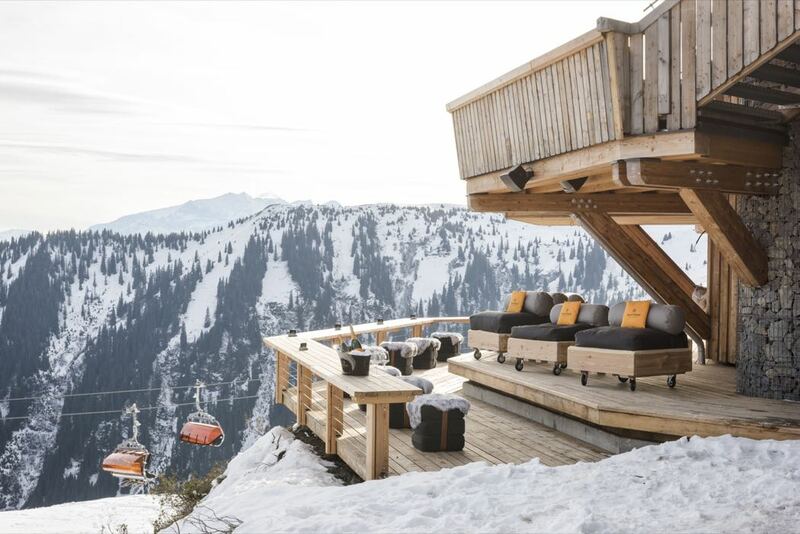 With the fitting slogan “urban soul meets the alps”, mama thresl is a superbly modern version of a chalet, with chunky wood finishes and innovative outdoor spaces housing fireplaces and jacuzzis underneath the alpine stars. 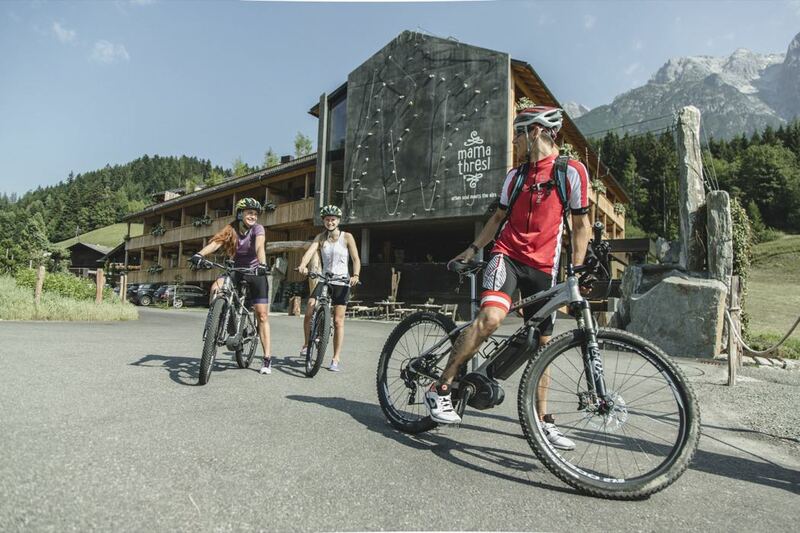 The hotel is located at the foot of the Leogang Mountains and a short walking distance from the Asitz mountain railway that is part of the Skicircus Saalbach Hinterglemm Leogang Fieberbrunn and the Bikepark. 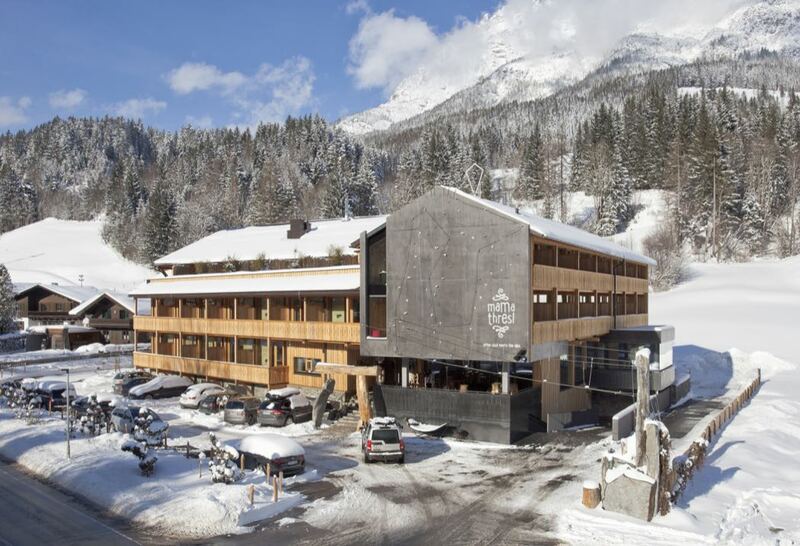 Built in solid-wood architecture, the most striking feature that you notice about the hotel as you arrive is the huge rock wall on the side of the building. 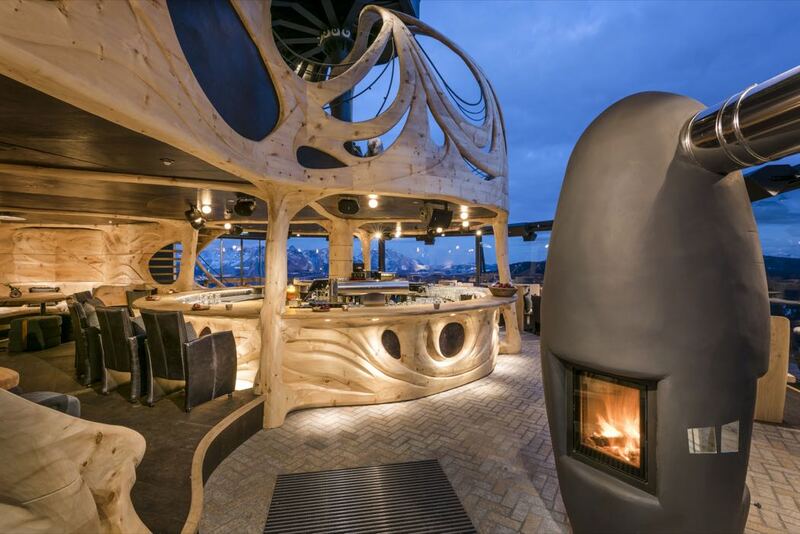 At almost seven meters tall, it sits right in front of the entrance. 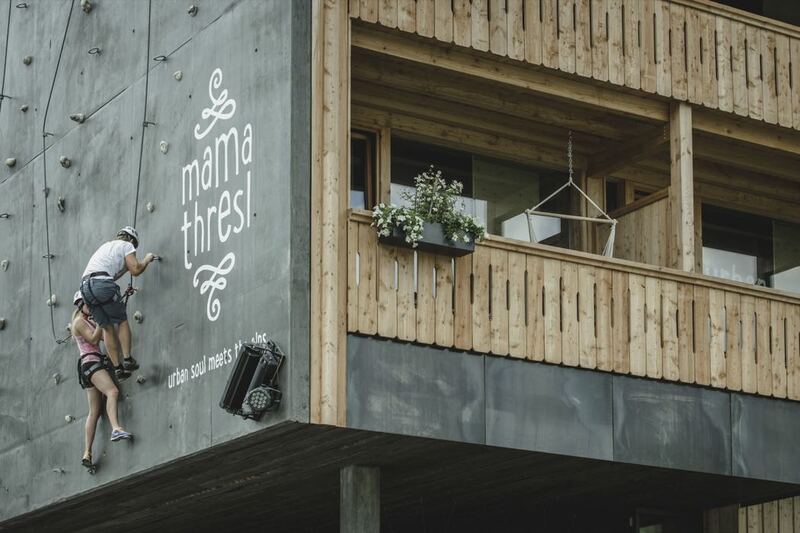 Inside, the design of mama thresl is a mixture of tradition and trend. 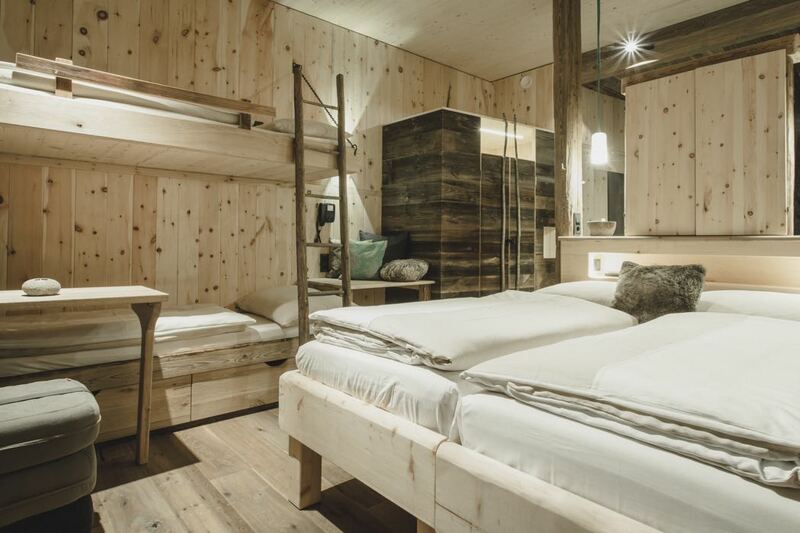 Local crafts meet natural materials, such as arolla pine, larch wood, stone and linen in a modern setting. 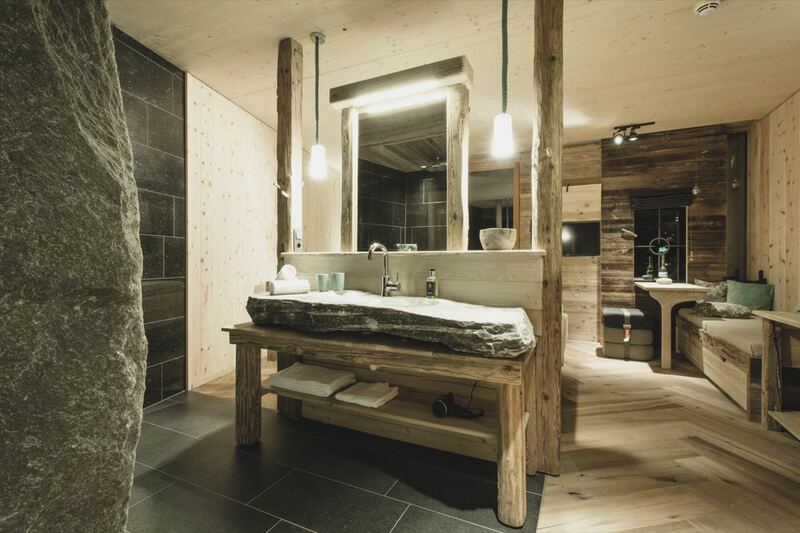 All of the 50 rooms are equipped with unique elements, for example the showers that are made of solid rock. 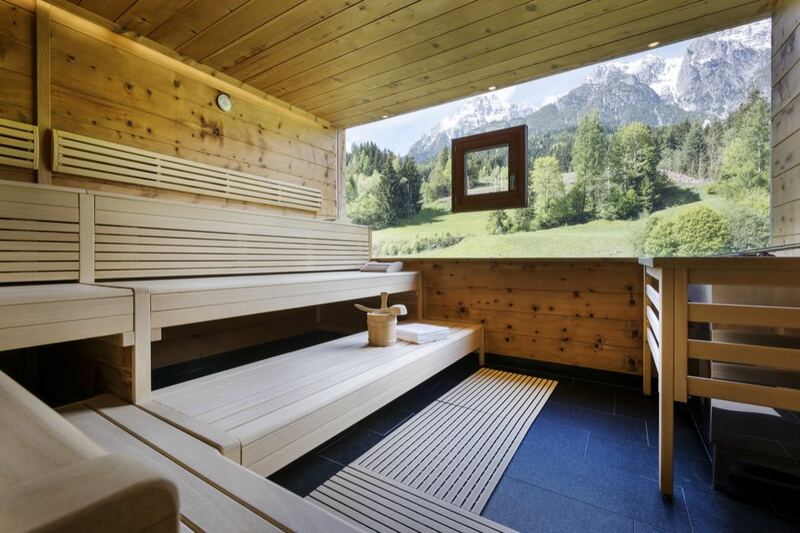 Higher room categories offer a detached bathtub and a private sauna or a hot tub on the terrace. 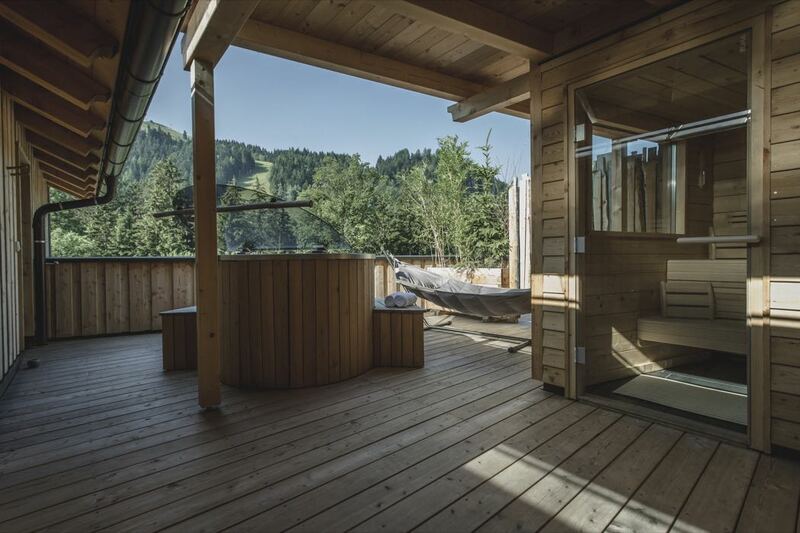 There is a small shared recreational area with Finnish sauna and chill-out room offering a panoramic view onto the Leoganger mountain range. 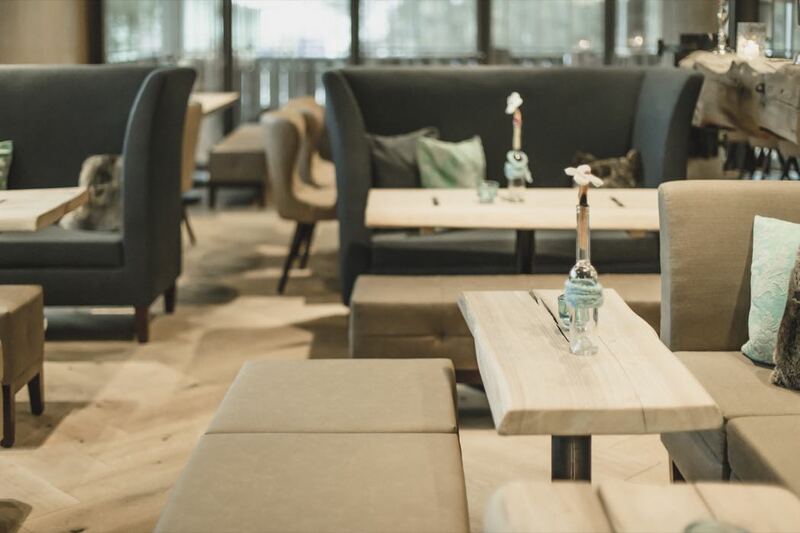 The hotel offers Wi-Fi throughout, as well as uncomplicated breakfast which is served until late (around 11am). 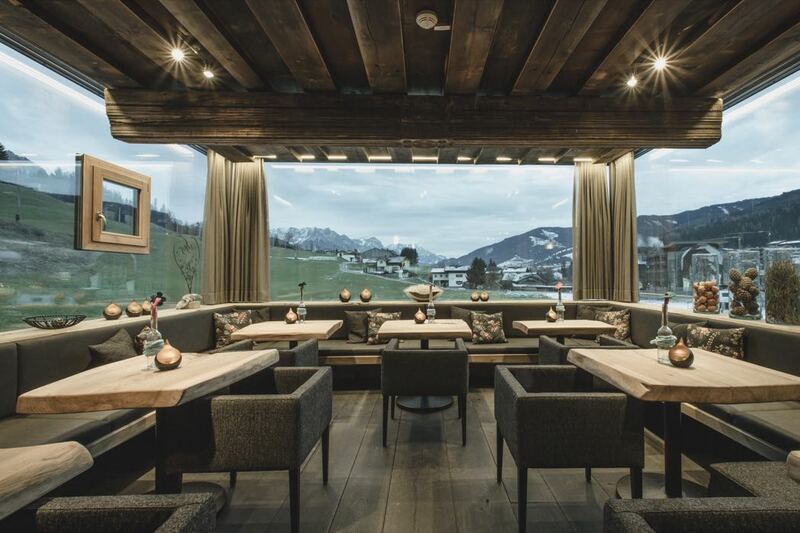 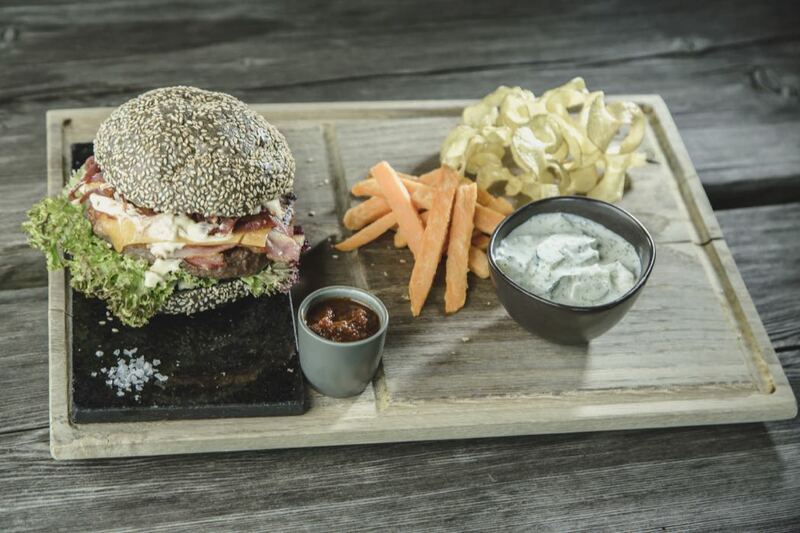 In the evening, the restaurant offers delicious regional products, such as steaks, tarte flambée or fresh salads. 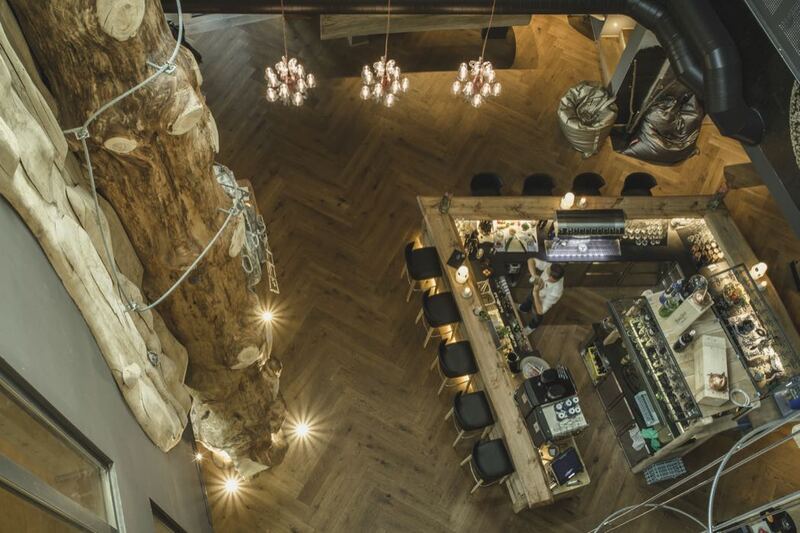 As part of the drama, when you select a bottle of wine, the waiters who are equipped with a climbing harness, are pulled up a two-storey wine cabinet. 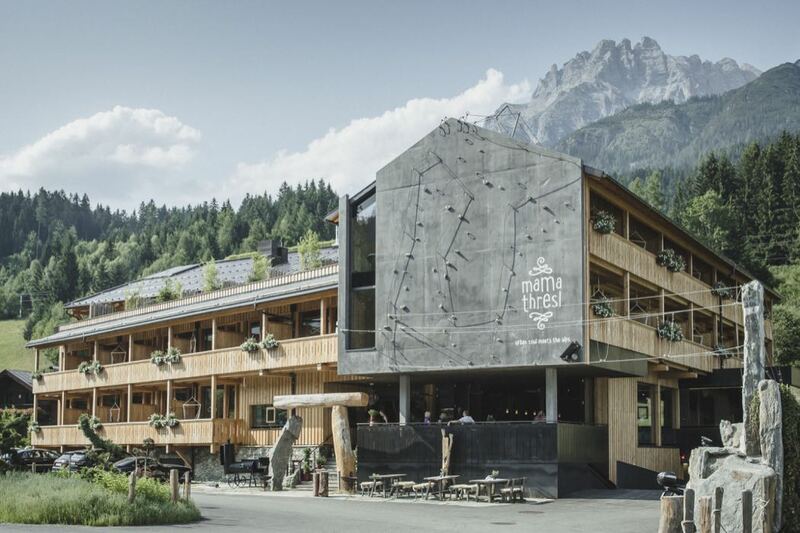 A climbing wall right next to the bar leads to a platform under the roof, where up to four people can sit for an exclusive dinner. 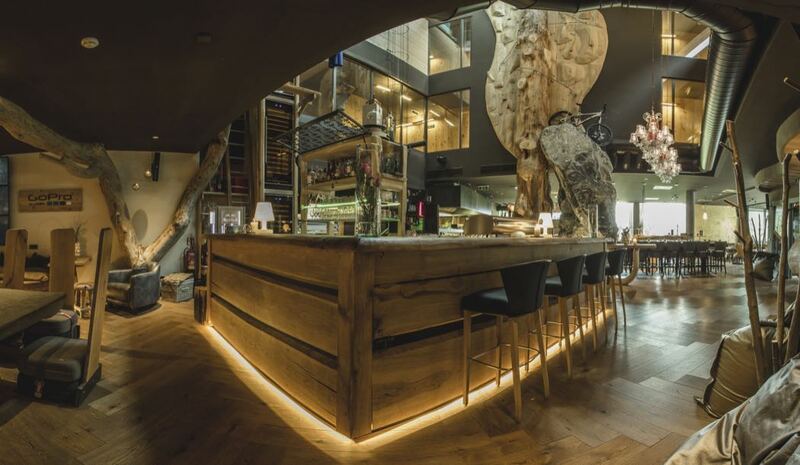 mama thresl’s bar is a great place to spent the rest of the night with cocktails and hip tunes from a liveDJ. 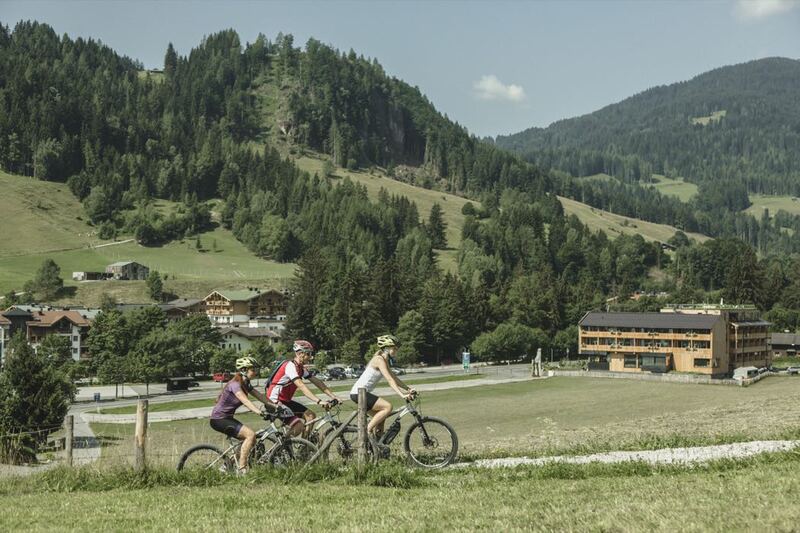 mama thresl is home from home for mountain lovers who are young or young at heart. 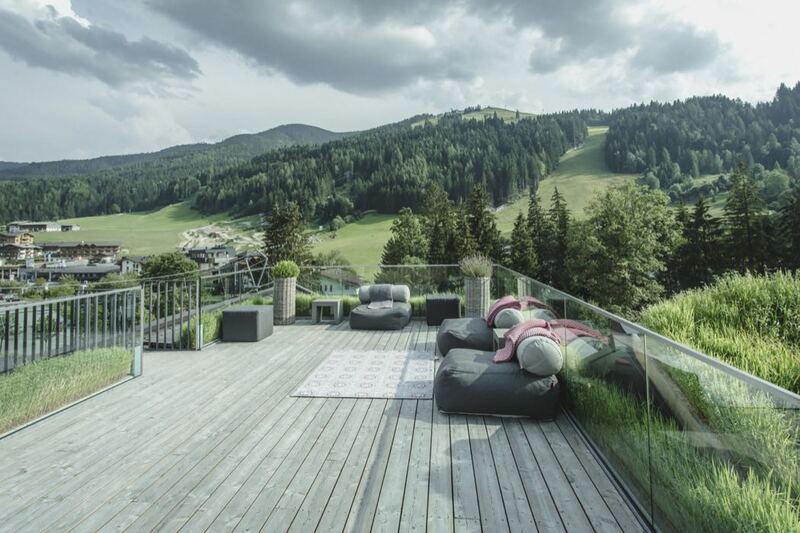 With superbly decorated rooms and a fun vibe, this is the perfect place to let your hair down in the fresh Alpine air.